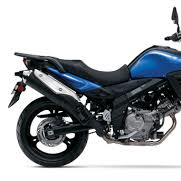 Read and compare owner reviews & ratings of Suzuki V-Strom 650 2013. Vehicle specs, photos & video, pricing, and more! Disclaimer: This is my first motorcycle, i.e. I don't know what I don't know about what's good bad and ugly about motorcycles. Ahh, ignorance is bliss ... IMO this bike was very easy to ride from day one and I can't imagine a better starting bike for me (YMMV -- I'm six feet tall and 200 lbs). I don't consider myself to be a natural at anything so the ease with which I took to riding this bike says more about the forgiving nature of the bike than the rider. The 650 v-twin seems smooth and has always delivered the power I've needed whether on the highway or my limited dirt experience and when loaded with camping gear. Once off-road or taking my daughters two-up on the bike, I definitely notice the stock factory suspension is being pushed. I hope to remedy this in the near future. All in all, based on my limited riding experience and current needs, I'm very pleased with this bike. It's price point allows me to add and upgrade only what I want to add or upgrade. Farkles: Barkbusters Storm handguards, Givi 52L Trekker Case, OEM side cases, OEM center stand, Weld86 skid plate.